The CCM Premier P2.5 Senior Goalie Leg Pads are a lower mid-level pad. Recommended for 1 to 3 uses per week. New for 2018 is the CCM Premier P2.5 Goalie Leg Pads. CCM Has made a lot of new changes for the 2018 Premier line. The first major difference is the weight, although the Premier line has always been well received, it was very heavy by todays standards. 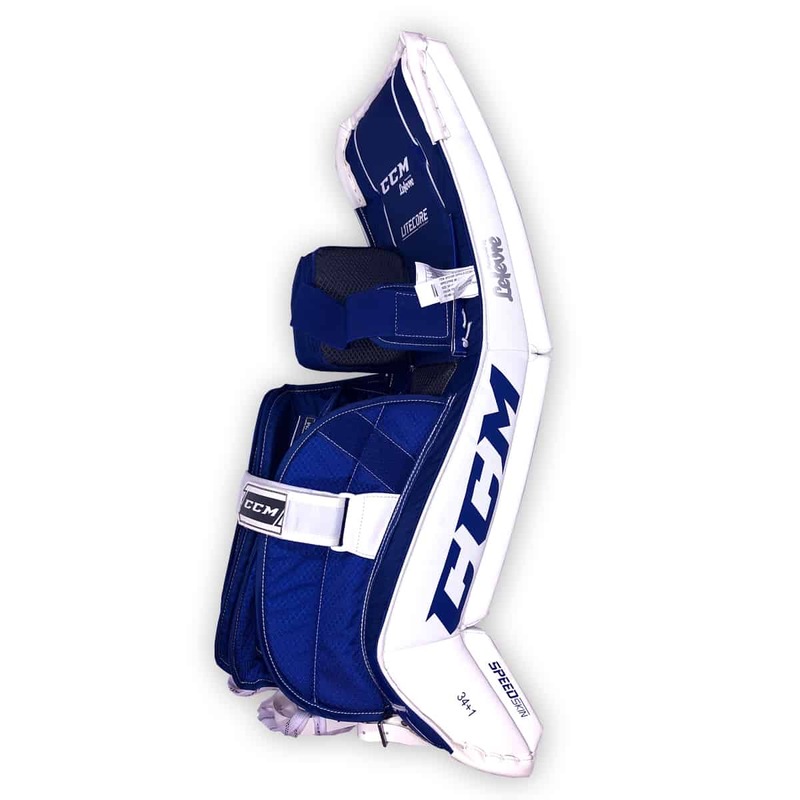 CCM has decreased the weight of the Premier line by more the 20% and now this series went from being one of the heaviest to one of the lightest pads on the goalie market today. CCM has also softened the boot on the Premier line which does help the goalie transition from the butterfly technique to the recovery position. 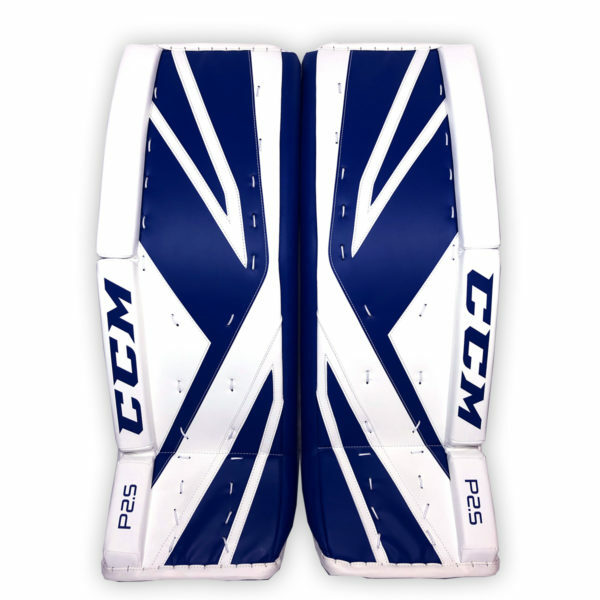 The new Premier P2.5 pads has changed to a quick strapping system which allows the goalie to get dressed and undressed very quickly. The quick strap system is made of elastic straps which allow the pads to be worn tighter the goalies leg without losing rotation. 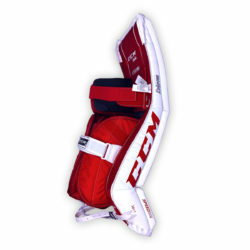 With the traditional leather straps of previous generations, the straps need to be worn loose to allow the pad to rotate properly when the goalie went into the butterfly technique. 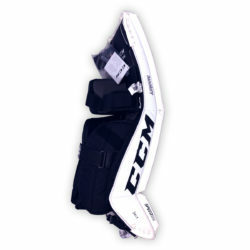 With the new elastic strap system, the pads can be worn tighter and still accomplish the same desired effect. Another new feature for 2018 is one break on the vertical roll, this gives the pad a bit more flex then the previous generation but still keeps the thigh rise stiff and strong – which is need for wider butterfly style goalie. The Premier pads were built to maximize coverage and one break is the most you would want on this style pad. If you need a double break pad, then please look to the E-Flex line – if your butterfly is not wide enough to maximize coverage, then a maximum coverage pad is probably not for you. There are many questions to the difference between the CCM Premier P2.9 and the P2.5 lines. Basically this comes down to quality of materials. Both are built on the same design patterns, identical in most ways. The big difference is in the materials and how they will last. 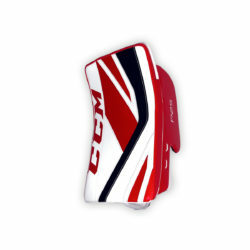 Both pads will protect the goalie, so it is not like one pad is far superior protection wise then the other. It will come down to use and durability. If you are playing once or twice a week, the P2.5 or the P2.9 will be a good options for you. If you are playing three, four, five times a week, the P2.9 is the better option in this scenario because the materials are better and are capable of taking more abuse. The P2.5 would work in the second scenario however the pads will break down much quicker. 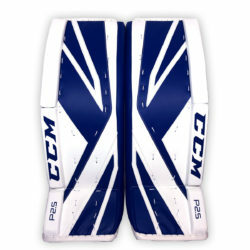 It is important for the goalie to calculate their playing time when considering which pad is best to purchase. Inner Flex – Pre-curved with no break core for enhanced 5-hole closure. 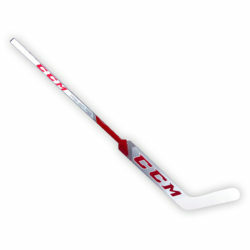 Boot Angle – 60 degree angle to help direct pucks into the corner or boards. Senior Knee Cradle – Recessed foam with a removable knee cradle wrap (senior only). Soft foam without an outer knee wrap (junior only). Deeper knee cradle for enhanced 5-hole closure. 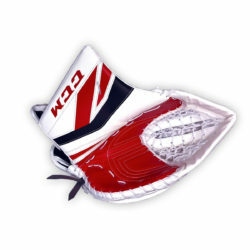 Knee Raiser – 3D Grip/PE foam (senior only) and Nylon/PE foam (junior only). Helps seal the pad to the ice.